Scrollbar and progress-bar replacements for Leopard and Snow Leopard. Is there a better alternative to Aqua Extreme? Is Aqua Extreme really the best app in System category? 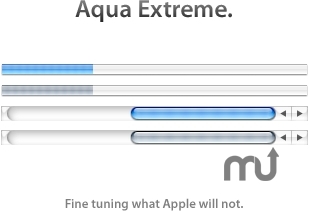 Will Aqua Extreme work good on macOS 10.13.4? Aqua Extreme needs a rating. Be the first to rate this app and get the discussion started! Aqua Extreme... Mac OS X introduced a new GUI called Aqua. The initial Aqua interface had quite a different look from the Aqua we know today. Buttons had a more distinct 3D-appearance, with stronger gloss and heavier shadows. The 10.2 installment of OS X brought a more refined style with a flatter, more crisp button appearance. Almost every element had been refined, except for the scrollbars and progressbars which was overlooked. What's puzzling is that it has been continuously overlooked ever since. I first introduced my own refined scrollbars and progressbars for 10.2. I had a falling out and did not update them for Leopard. But now that Snow Leopard is here, still using the 10.0 style elements, I thought it was time to do something about it. This installer will replace the large and small versions of both the scrollbars and progressbars with ones that better match the appearance of the rest of the interface. They look flatter and more crisp and work with both the Blue and the Graphite appearance settings. If you decide you want to revert to the original Aqua style, please run the separate Restore Aqua installer.